I’ve been a big fan of Leo Laporte and his This Week in Technology (TWIT) podcast for years. He’s been so successful that he now has a network of video and audio podcasts covering a wide range of digital topics; This Week in Google, TWIT Photo, Security Now, iPad Today, MacBreak Weekly, Windows Weekly, Tech News Today, All About Android and more. If you don’t already listen to one of these shows, start. It’s simple as that. However, as a prognosticator he’s come up short a number of times. He predicted failure for things like the iPhone (“that’s not a business Apple should be in”) and Apple retail stores (“Remember Gateway?”). My personal opinion is that predictions are an area of chronic weakness in human intelligence; even the best informed experts have the same success ratio over the long run as a coin-flip. So I don’t really blame him for missing the boat with his guesses; I take them with the customary grain of salt. But recently he’s been on a tear claiming that Email is Dead, replaced by social media like Twitter and The FaceBook (can you tell I’m not a fan of either?). I put social media in the same category as reality television: the most productive people I know consume very little of either. In the spirit of money talks and BS walks, let’s take look at the numbers in the infographic below. 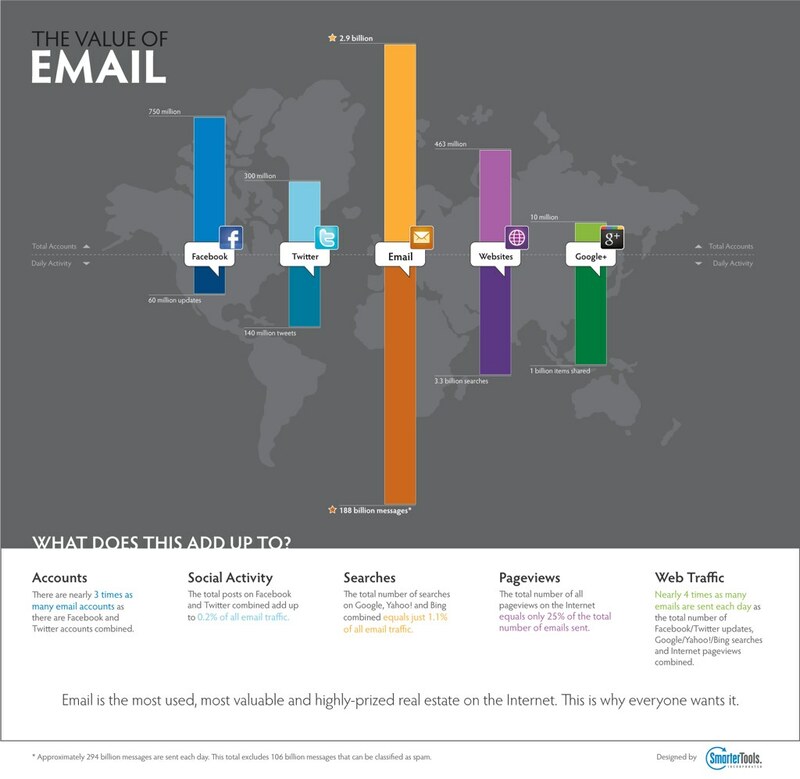 There are 3 times as many email accounts as there are Facebook and Twitter accounts combined. The total posts on Facebook and Twitter combined add up to 0.2% of all email traffic. The total number of searches on Google, Yahoo! and Bing combined equal just 1.1% of all email traffic. The total number of all page views on the Internet equal only 25% of the total numbers of email sent. Nearly 4 times as many emails are sent each day as the total number of Facebook/Twitter updates, Google/Yahoo!/Bing searches and Internet page views combined. So, with no disrespect to Leo, the answer to the question Is Email Dead? has to be, not hardly.